Hello and welcome to Mama Elephant’s #celebrating6years Anniversary Release Stampede! I am so honored to participate this exciting event. The release is live and available for purchase in the Mama Elephant shop! 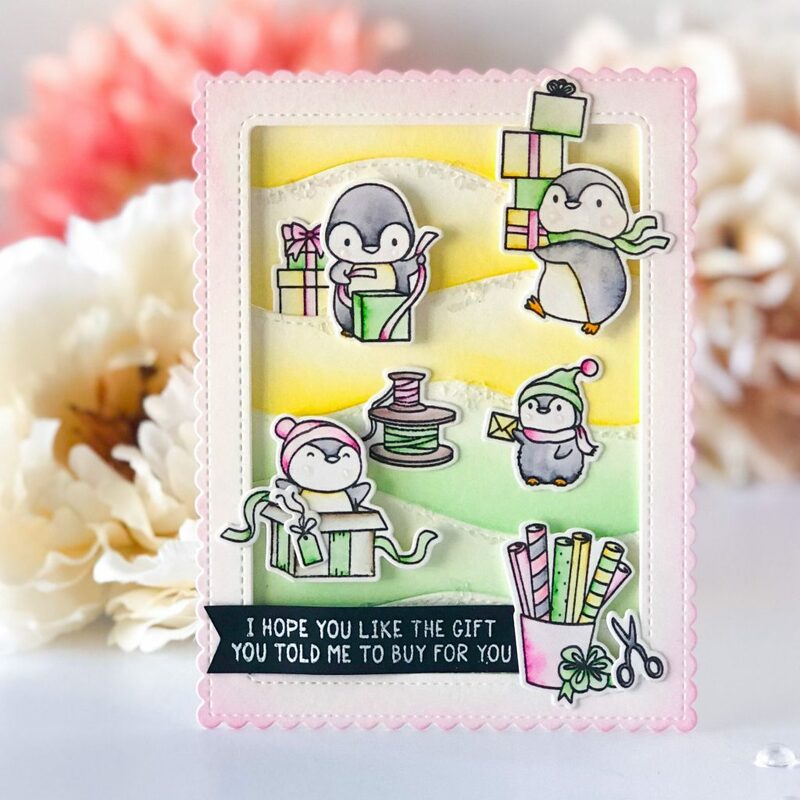 I am here showcasing Mama Elephant – Cool Penguins Stamp set. Christmas is around the far corner. It is never too early to make Christmas cards. Do you agree with me?! Wink wink……… I created two cards to share with you! To begin with, I stamped all images from Mama Elephant Cool Penguins Stamp set onto Bristol Smooth paper and colored with Kuretake Zig Clean Color Brushes. Then I cut them with Mama Elephant Cool Penguins Coordinating Dies and set aside. I started to prepare my background. First of all, I die cut an A2 panel using Mama Elephant Hill Cover-Creative Cuts and I ink blended each bottom of hill with Tim Holtz Distress Oxide ink in Squeezed Lemonade and Cracked Pistachio. on the top edges of hills, I added Multi Medium Matte and poured Vintage Glass Glitter to create snow effect. I die cut a frame using Mama Elephant Madison Avenue- Creative Cuts and lightly ink blended l with Tim Holtz Distress Oxide ink in Picked Raspberry, then I attached it onto the background with foam tapes. I adhered all selected images using Multi Medium Matte and foam tapes to the background panel. I stamped the sentiment onto a piece of black cardstock using VersaMark embossing ink and poured WOW! embossing powder with heat. I hand cut the fish tail ribbon and attached it with some wavy dimension to finish. It’s perfect to create a snowy day for penguins to enjoy so I decided to go for a cooler scene. I repeated my very first step from last card making. I stamped all images from Mama Elephant Cool Penguins Stamp set onto Bristol Smooth paper and colored with Kuretake Zig Clean Color Brushes. Then I cut them with Mama Elephant Cool Penguins Coordinating Dies and set aside. First, I cut the crossed stitched frame using a die from Mama Elephant Sew Fancy – Creative Cuts and ink blended with Tim Holtz Distress Oxide ink in Tumbled glass, then I attached it onto an A2 card panel using foam tapes. I splattered Tumbled glass and water mixture by tapping a watercolor brush onto the background to create snow in the air. And I also cut the center window using a die from Mama Elephant Union Square – Creative Cuts. I created snowy hills by cutting the negative part of window using Mama Elephant Ocean Waves Trio – Creative Cuts. I adhered all selected images using Multi Medium Matte and foam tapes to the background panel. I realized it was kinda empty in the window, so I picked an star light string image from Mama Elephant Merry Mantle Stamp Set. In the end, I stamped the sentiment to the lower portion of the card using Memento ink in Tuxedo Black. To celebrate with you, here is an amazing sale and promotion and giveaway! Keep reading to the end! 10% off entire store! No code required! Spend $100* – receive 1 free ‘Color Me Letters’ 4×6 stamp set. 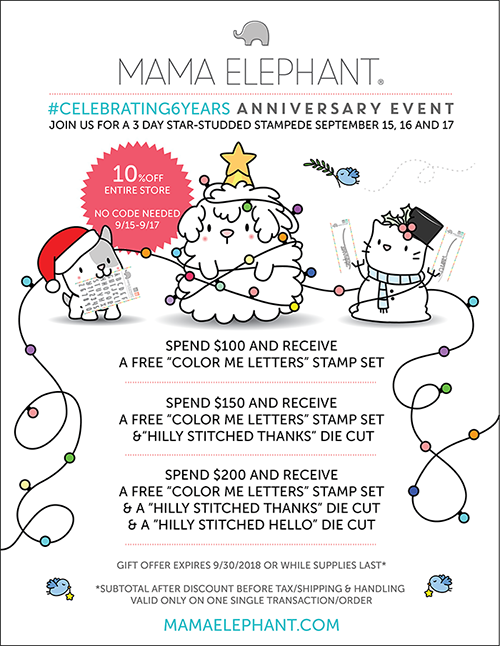 Spend $150* – receive 1 free ‘Color Me Letters’ 4×6 stamp set and ‘Hilly THANKS’ dies. 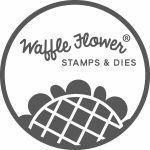 Spend $200* – receive 1 free ‘Color Me Letters’ 4×6 stamp set, ‘Hilly THANKS’ dies, and ‘Hilly HELLO’ dies. *Subtotal amount must be met before any shipping fees/tax/customs. Free item(s) valid only a single order/transaction. Limit one of each free offer per order. Orders cannot be combined. New orders only. We reserve the right to cancel/modify orders. Free offer valid 9/15-9/30 or while supplies last! To celebrate this mega anniversary release, Mama Elephant is giving away of ten $25 ME gift certificates throughout the 3 day stampede! Winners will be chosen at random from the collective blogs in the Stampede. Winners will be announced on the last day of Stamp Highlights. You have up to 4 chances to qualify to win! Joining on this wild ride of a stampede are lots of crafty designer friends! Please visit them to see what they did with the new goodies! And that’s a wrap to the 3 day mega stampede! Make sure you checked out Day 1 and DAY 2! Thanks all for joining us! The celebration continues all month long! This entry was posted in Cards and tagged Blog Hop, Mama elephant, stampede. Adorable cards! I love the yellow and green background. Wow…this two cards are super cute! Both of those cards are ridonkulously cute. Wow… Stunning. So cute. Love the framing. All those gift-wrappers would be me! So cute! 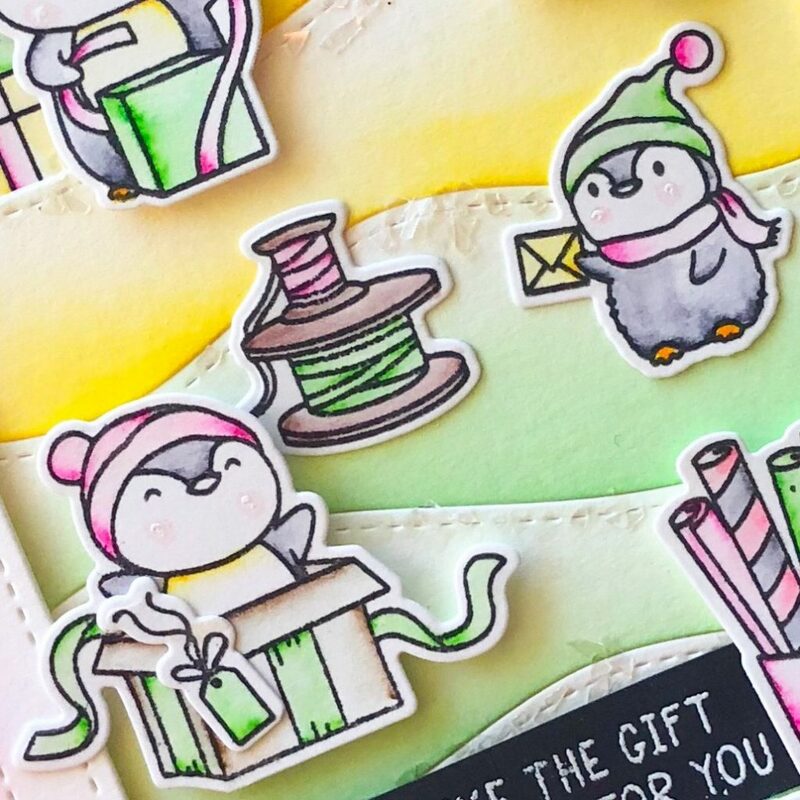 Love the soft pastel critters! Super sweet cards!! Those penguins are just too cute!! 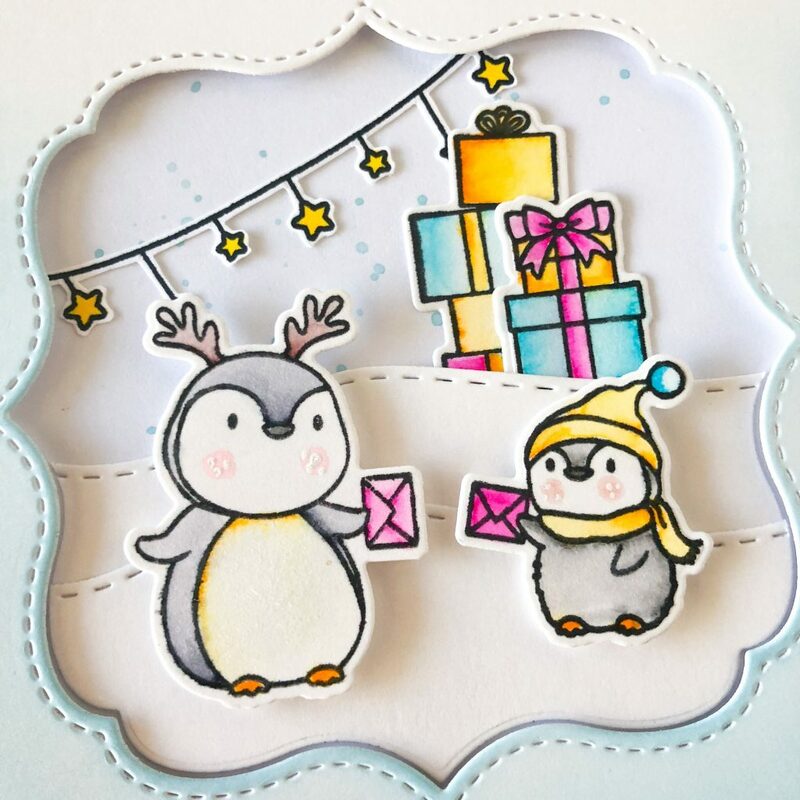 Such sweet cards, I love these adorable penguins! Thanks for your cute inspiration! Absolutely adorable cards! Super sweet scenes and lovely colors. I am in awe of your creativity! Cute cards! I love your soft colors. Cute little penguins. Love the colours. I just love all the penguins!! Especially the ones with the little pink cheeks!! You did an amazing job!! I love the coloring with the Zigs. Great job!! 1. Adorable cards!!! Love your colouring!!! 3. Following Mama Elephant on Twitter and just retweetted as @raggiodiluce82 (Arianna Barbara). see the little critters wrapping theirs. Wow, you have created a couple of awesome scenes! Great designs, beautifully colored. So cute! You make these penquins come to life! The Cool Penguins are one of my fave sets. On the first card, the color combo is wonderful, and your scene-building skills are Fantastic. Oh those penguins are so cute! Both cards are too cute! Great subtle colors! Your cards are so cute! I love those little penguins – they are so stinkin’ cute! Thanks for the inspiration! Those cards are so adorable. Your coloring is beautiful and I love the sentiments. Great release. I love this release! It is all adorable!! What cute cards! I love the sentiment on the first card and the ombré color background on the second! The penguins are just so cute & I’m liking your cards so much, particularly card #1 with all of the dimension. The sentiments are a hoot too! 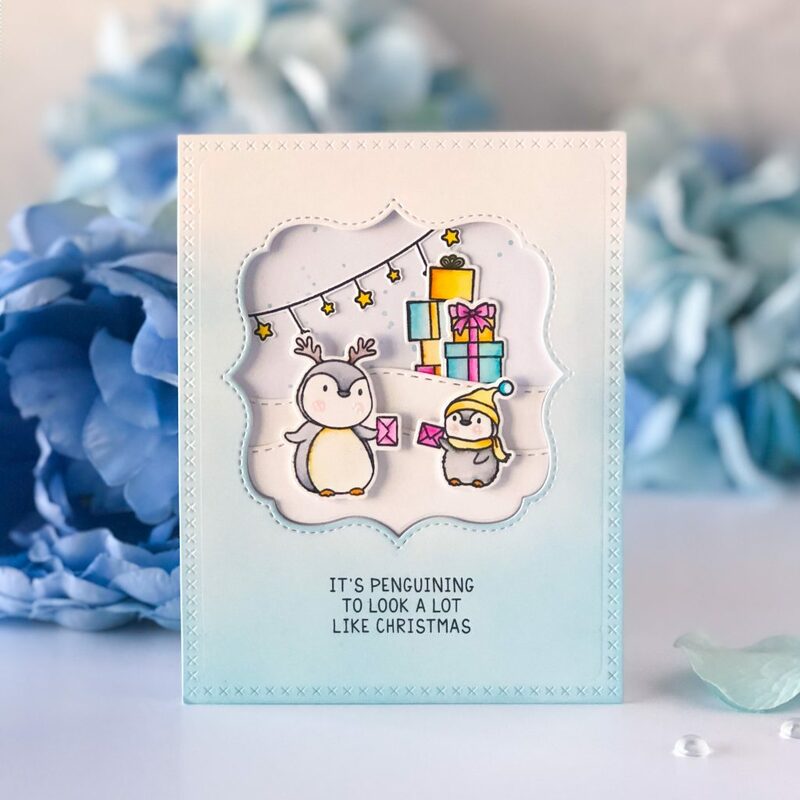 Love the lemon lime background on the penguin with the touch of sparkle – that’s really pretty! Your light blue penguin card is pretty too, but the first one is a really unexpected color combination and I really like it! I have to wait until next month’s paycheck before I can buy this cute set – hope they don’t sell out (or that it is restocked really fast!) Thank you for the beautiful holiday inspiration! 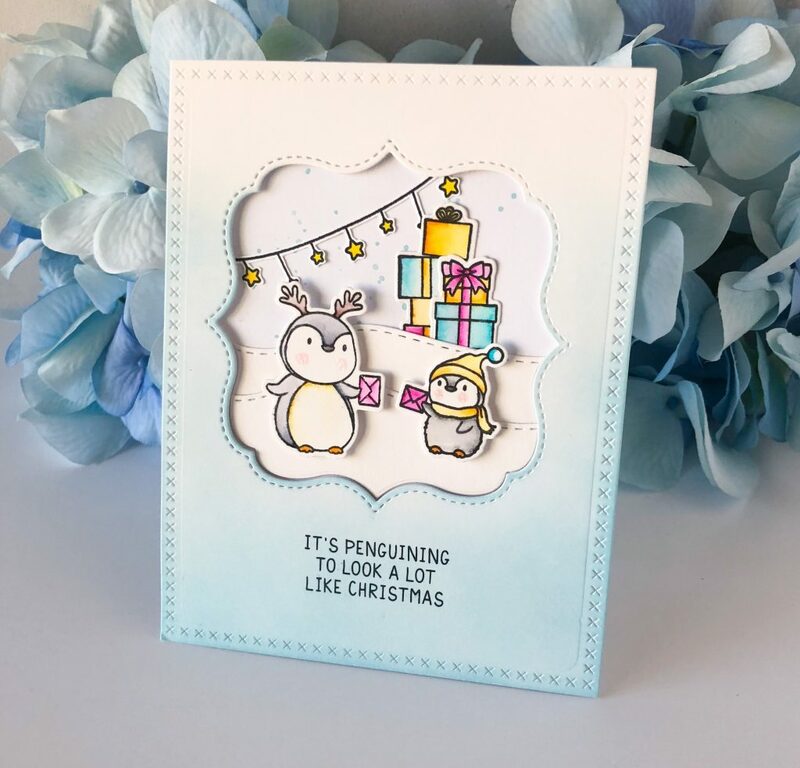 I love how you made the snow ‘hills’ in the second card with the ocean wave dies! It’s good to remember that supplies can be used in multiple ways! Great cards! Love everything about your two cards….they are so cute and the sentiment on he first made me lol!! very nice cards. i really enjoy the soft colors you’ve used, and the rosy little cheeks of your penguins. 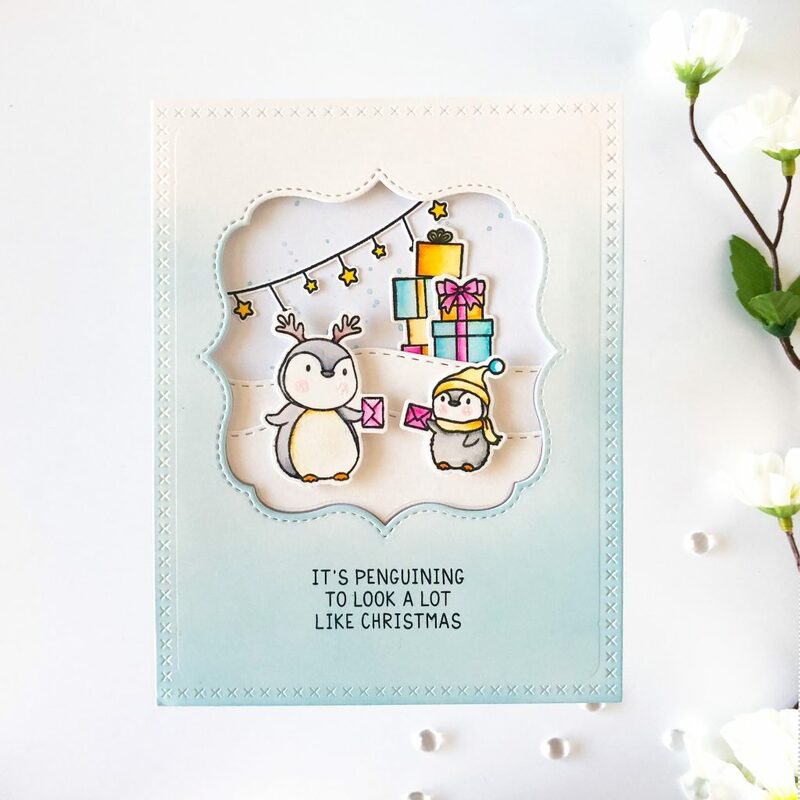 Adorable cards with the cutest penguins ever! Pretty coloring and details! Following & commenting on instagram! These are both so cute. (How could they not be, with those adorable penguins on them?) I love all the layering you did on them. Omg these penguins!!!!! Love love! Love these penguins. I love the soft pastels you used on the first card. I am totally smitten with these penguins. Such cute scenes/cards! 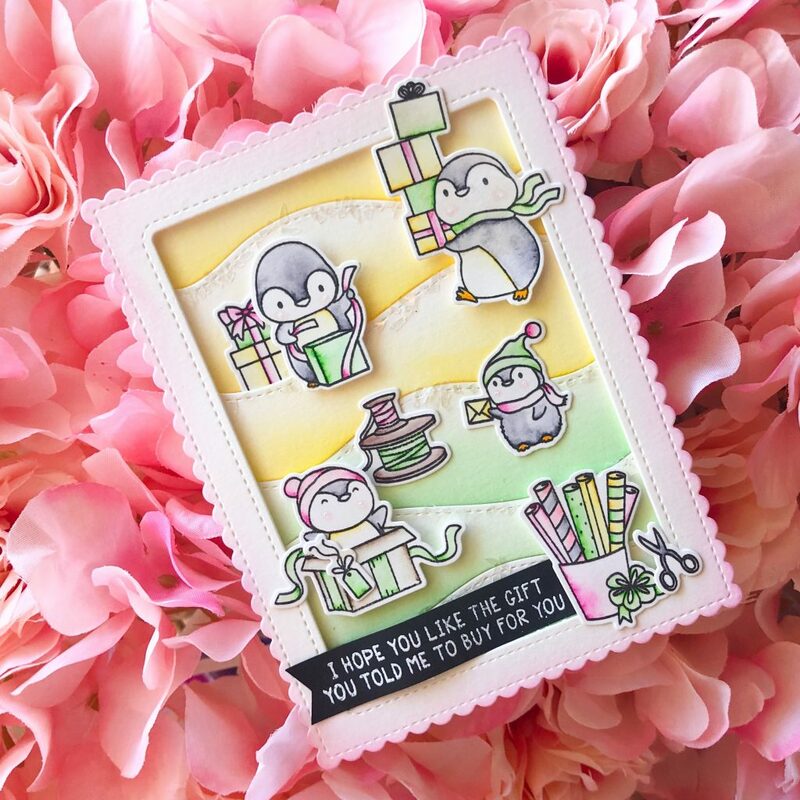 These cards are so, so very sweet; those penguins are just the most adorable creatures! These are so adorable!!! I just love the adorable penguins! Wow those penguins are so cute! Great cards. Terrific cards. Love the penguin set. Too cute! Super CUTE! I especially love the penguins exchanging cards! Gorgeous cards – i really love the colours you’ve used for the first one. 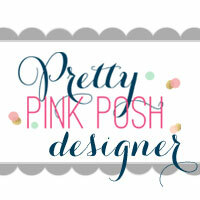 very pretty – love your color pallet ! Love these penguins, cute makes! Wow, these are adorable! I love how you went with pastels in your cards. It works so well with those cute penguins. Fantastic coloring and ink blending! Those penguins are the cutest! Love your cards and especially the added snow look! Such cute cards! I like how fuzzy the penguins look with your coloring. What fantastic cute cards! I love the background on the first card! Love this penguins! Great cards, thanks for the inspiration!